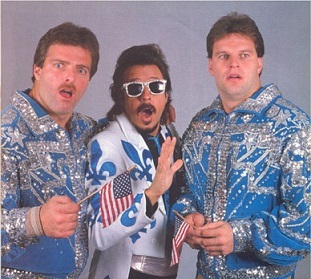 - WWF The Big Event (August 28, '86) = The Fabulous Rougeau Brothers (Jacques & Raymond) defeated the Dream Team. - WWF Wrestlemania III (March 29, '87) = The Fabulous Rougeau Brothers fell to the Dream Team. - WWF Survivor Series '87 (November 26) = The Fabulous Rougeau Brothers, Strike Force, the Young Stallions, the Killer Bees, & the British Bulldogs competed in an "Elimination" Match with Demolition, the Hart Foundation, the Islanders, the Bolsheviks, & the New Dream Team. The Rougeaus were eliminated by Demolition. The Killer Bees & the Young Stallions were the 'survivors'. - WWF Wrestlemania IV (March 27, '88) = Rougeau competed in a "Battle Royal", which was won by Bad News Brown. - WWF Wrestlefest '88 (July 31) = The Fabulous Rougeau Brothers took down the Killer Bees. - WWF Summerslam '88 (August 29) = The Fabulous Rougeau Brothers fought to a Draw with the British Bulldogs. - WWF Saturday Night's Main Event #18 (November 18, '88) = The Fabulous Rougeau Brothers beat the Young Stallions. - WWF Survivor Series '88 (November 24) = The Fabulous Rougeau Brothers, Demolition, the Brain Busters, the Bolsheviks, & the Conquistadors fought in an "Elimination" Match against the Powers of Pain, the Hart Foundation, the British Bulldogs, the Rockers, & the Young Stallions. The Rougeaus were eliminated by the Hart Foundation. The Powers of Pain were the 'survivors'. - WWF Royal Rumble '89 (January 15) = The Fabulous Rougeau Brothers & Dino Bravo lost a "Three Falls" Match to Jim Duggan & the Hart Foundation. - WWF Wrestlemania V (April 2, '89) = The Fabulous Rougeau Brothers were beaten by the Bushwhackers. - WWF Summerslam '89 (August 28) = The Fabulous Rougeau Brothers & Rick Martel defeated Tito Santana & the Rockers. - WWF Saturday Night's Main Event #23 (September 21, '89) = The Fabulous Rougeau Brothers lost to the Bushwhackers. - WWF London Arena (October 10, '89) = The Fabulous Rougeau Brothers fell to the Rockers. - WWF Survivor Series '89 (November 23) = The Fabulous Rougeau Brothers, Rick Rude, & Mr. Perfect fought in an "Elimination" Match against Roddy Piper, Jimmy Snuka, & the Bushwhackers. Jacques was eliminated by Snuka. Mr. Perfect was the 'sole survivor'. - WWF Royal Rumble '90 (January 21) = The Fabulous Rougeau Brothers were beaten by the Bushwhackers. 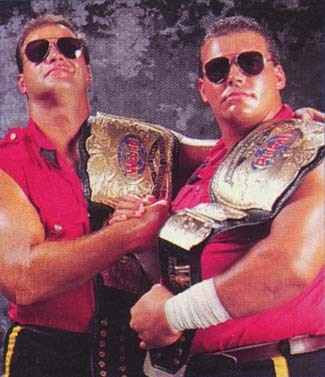 - WWC 17th Anniversary Show (July 7, '90) = The Fabulous Rougeau Brothers lost to the WWC Tag-Team Champs, the Super Medicos. - WWF Royal Rumble '91 (January 19) = The Mountie defeated Koko B. Ware. - WWF Wrestlemania VII (March 24, '91) = The Mountie pinned Tito Santana. 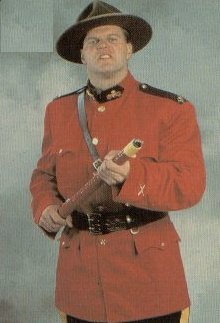 - WWF Summerslam '91 (August 26) = The Mountie lost a "Jailhouse" Match to the Big Boss Man. - WWF at Royal Albert Hall (October 3, '91) = The Mountie beat Kerry von Erich. Later on, the Mountie competed in a "Battle Royal", which was won by the British Bulldog. - WWF Survivor Series '91 (November 28) = The Mountie, Ric Flair, Ted DiBiase, & the Warlord fought in an "Elimination" Match against Roddy Piper, Bret Hart, Virgil, & the British Bulldog. The Mountie was counted out. Flair was the 'sole survivor'. 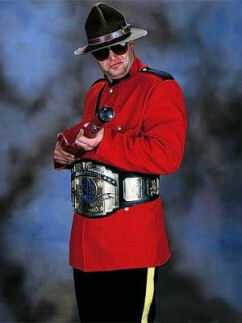 - WWF Royal Rumble '92 (January 19) = The Mountie lost the WWF Intercontinental Heavyweight Title to Roddy Piper. - WWF Wrestlemania VIII (April 5, '92) = The Mountie, Repo Man, & the Nasty Boys lost to Jim Duggan, Sgt. Slaughter, Virgil, & the Big Boss Man. - WWF UK Rampage '92 (April 19) = The Mountie pinned Virgil. - WWF Summerslam '92 (August 29) = In a dark match, the Mountie & the Nasty Boys fell to Jim Duggan & the Bushwhackers. - WWF Survivor Series '93 (November 24) = Quebecer Jacques, Ludvig Borga, Crush, & Yokozuna fought in an "Elimination" Match against Lex Luger, the Undertaker, & the Steiner Brothers. Jacques was eliminated by Luger, who was the 'sole survivor'. - WWF Royal Rumble '94 (January 22) = The Quebecers (Jacques & Pierre) retained the WWF World Tag-Team Titles, winning, via ref's decision, over Bret & Owen Hart. - WWF Wrestlemania X (March 20, '94) = The Quebecers lost, via Countout, to Men On A Mission. - WWF Jacques Rougeau Retirement Show (October 21, '94) = Rougeau defeated Pierre Oulette. - WCW World War III '96 (November 24) = The Amazing French Canadians (Jacques Rougeau & Pierre Oulette) fell to Harlem Heat. Later on, Rougeau competed in the "WWIII Three-Ring Battle Royal", which was won by the Giant. - WCW Clash of the Champions XXXIV (January 21, '97) = The Amazing French Canadians fell to the Steiner Brothers. - WWF No Way Out '98 (February 15) = The Quebecers (Rougeau & Pierre Oulette) lost to the Godwinns. - WWF Wrestlemania XIV (March 29, '98) = The Quebecers competed in a "Tag-Team Battle Royal", which was won by the Legion of Doom 2000.